Was it a miracle that two young hospitalized girls with childhood cancer who selflessly prayed for the other girl to be cured woke up on the same morning about a month later cancer free? This inspirational, heartfelt children's story attempts to motivate children with cancer to actively participate in curing themselves through visualization techniques and the power of prayer. This heartwarming story offers hope for children suffering from cancer. The book thoroughly explains the disease, its treatment, and the changes it brings. Through vibrant illustrations and a triumphant tale of hope and healing, the story focuses on the power of prayer, optimistic thinking and visual imagery. Overall, this book will have a positive impact on both children and adults. I would highly recommend adding Jenny Cancer Survivor to your library of counseling resources or your personal library. "Jenny: Cancer Survivor" is exactly what the title informs the reader about, that it is possible to survive cancer. This book is directed towards children, who are going through the tough challenges of being diagnosed with cancer, including its treatments and, possible setbacks from the illness. It is also an inspiring book filled with a lot of hope in spite of a disease that causes so much fear and anxiety because a cure is yet to be found. I recommend this book for any child, who is fighting this illness, including young family members, who are trying to understand the effects of cancer. This is a beautiful written and illustrated book. "Jenny Cancer Survivor," by Paul M. Kramer does indeed fulfill its intended purpose. It is inspirational, heart warming and filled with faith and hope not only for the Survivor but also for loved ones as well. I am deeply humbled that you asked me to review your book. Reading this beautiful story demonstrates with God all things are possible for those who believe! Mr. Kramer has been able to provide a profound message to all those and their families that are still battling, survived or loss loved ones to cancer. 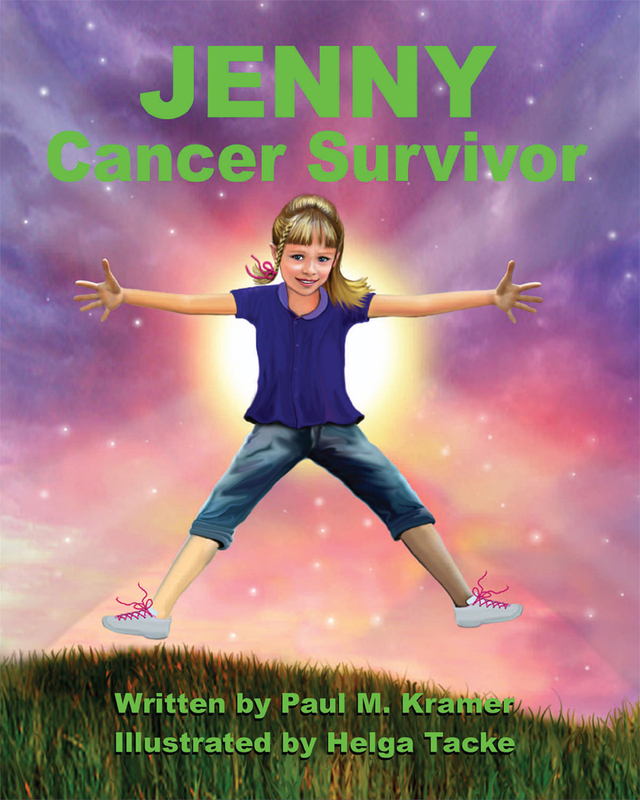 "Jenny Cancer Survivor," written by Paul M. Kramer brought tears to my eyes. This is a wonderful book that promotes hope and positivity to cancer stricken children and their families. Jenny is a fifth grader who tells her story of surviving cancer. She becomes sick and the doctor diagnoses her as having cancer. The colorful images help to tell this poignant story as Jenny begins chemo and radiation treatments. Her parents and her guardian angels keep her encouraged. Once she is in the children's hospital, she meets two other girls her age who are also battling cancer. She and Paige share a room and pray for each other. They lean on their trust in a Higher Power and in addition both girls envision soldier cells attacking and destroying their cancer cells that eventually all leave their bodies. This is a wonderful story of faith, trust and hope and it should be on the shelf of all classroom, school and public libraries. The direct and easily understood approach to dealing with this topic is refreshing. The message of medicine, hope and the power of attitude to overcome illness separate this story from many others. I would highly recommend "Jenny, Cancer Survivor" for a child or family dealing with a serious illness. As a childhood leukemia survivor; this author's approach to dealing with cancer mirrors the feelings and experience I had in surviving my bout with leukemia.